TriMet will be working with the Federal Transit Administration (FTA) to test the newest generation of pedestrian warning systems for buses. The FTA awarded us a $400,000 grant for the project. The FTA could have awarded multiple grants but instead awarded the total funds – $100,000 more than we requested – to TriMet. The FTA indicated our proposal had the most comprehensive approach to demonstrate the effectiveness of multiple warning systems. The DINEX STAR LED headlight has an intelligent system that calculates the bus’s speed and steering wheel angle. It automatically turns on additional super bright LED lights inside the headlight pointed in the direction of travel. Operators can better see objects on the road directly ahead. The headlight has built-in sound and light alert systems. When the bus is turning, it provides sound and light alerts to pedestrians and bicyclists at road crossings. Both the “Safe Turn Alert” and the “Turn Warning System” have audible warnings. When the bus operator turns the steering wheel, a warning is broadcast through external speakers on both sides of the bus alerting pedestrians and bicyclists that the bus is turning. Just what the audible warnings will be has yet to be determined. During the next four months TriMet will finalize the overall project, including selecting which buses and lines the systems will be tested on. The current plan is to test the devices on 45 buses. Fifteen of each type of device will be used. This is our second assessment of audible warning devices on buses. 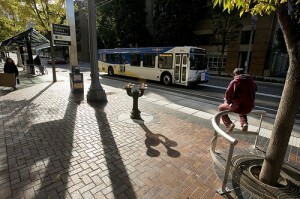 In early 2011, TriMet tested an audible pedestrian warning system on 10 buses. At that time, the technology was not advanced enough and a verbal voice alert that the bus was turning often came too early, too late or not at all. The test of the audible warning device was suggested as part of a comprehensive safety review initiated following the April 2010 bus crash in which two pedestrians died. As part of this new demonstration project, we will establish an industry peer review panel to get input from other transit industry leaders and engage other transit agencies in the use of safety technology. We will also seek feedback from riders and the community as part of the overall assessment.